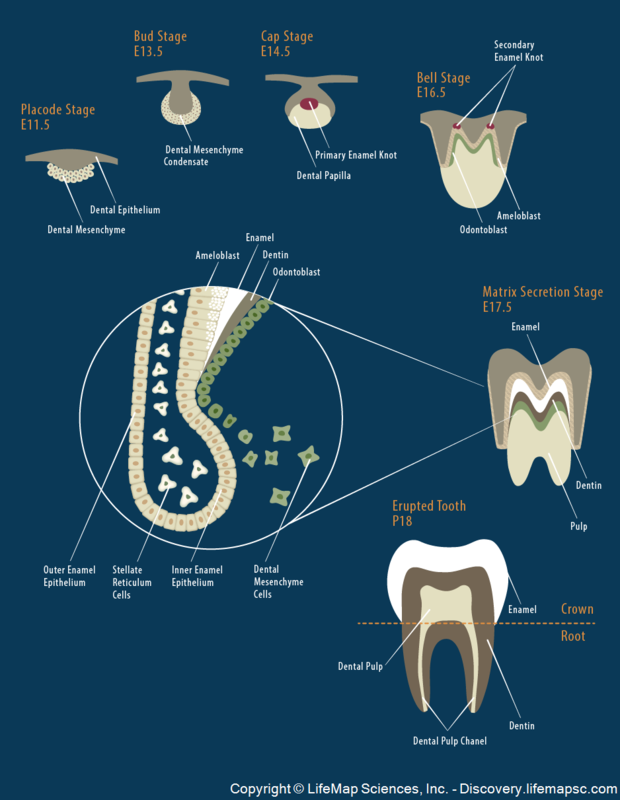 The stages of embryonic tooth morphogenesis are presented. The placode stage marks tooth initiation. The bud and cap stages represent tooth morphogenesis. Cytodifferentiation occurs at the bell stage, when differentiation of ameloblasts, derived from the inner enamel epithelium, and odontoblasts, derived from the dental mesenchyme, is complete. During the matrix secretion stage, ameloblasts and odontoblasts secrete enamel and dentin, respectively, to form the tooth body. The erupted tooth consists of the upper crown, comprised of the enamel and the dentin that encloses the dental pulp, and the root, which is comprised of dentin that encloses the pulp channels.